Bruxism is the habit of teeth grinding and clenching that is involuntary. It is experienced by a person usually at night during sleep, but may also be a problem in the daytime. The activity, which may occur in varying degrees of intensity, leads to tooth destruction and jaw disorders. If it is allowed to progress as it does, further complications may arise. An effective treatment is required to prevent the development of potential problems. 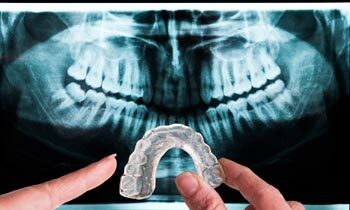 There are different options for treating bruxism, but wearing a night guard is the most common. A night guard for bruxism may be made with soft, dual laminate or rigid acrylic, depending on the specific requirement of the patient. When worn during sleep, it covers the teeth, acting as a protective cushion that protect the teeth and jaws from the constant pressure from grinding and clenching. While it is not a cure for bruxism, it stops the problem from getting worse and causing further complication. Phase 1: Tooth destruction. On some patients, night grinding occurs regularly and with high intensity. Regardless of whether the activity is experienced nightly or only on occasion, constant grinding and clenching of the teeth will lead to tooth destruction. The tooth abrades and since the enamel tissue does not regenerate, more tooth structure is lost as the unfortunate habit continues. Phase 2: Pulp exposure. Further tooth destruction wears vital structures away and when the enamel tissue is lost, the dentin layer is exposed. If this is allowed to continue, bruxism is going to cause teeth sensitivity. The pulp tissue has a direct connection with the nerves and when much tooth structure is lost, the pulp may be exposed and the tooth becomes extremely sensitive. Phase 3: Collapse of dental occlusion. As the more tooth surface is lost, the bite collapses. This is true for both the anterior and posterior teeth. The teeth hold and maintain dental occlusion and it will just follow as more structure is lost. Phase 4: Loss of facial integrity. The integrity of the facial structures relies on the integrity of the dental occlusion or bite. The skin and the muscles of face are supported by the teeth and when tooth structure and occlusion is compromised, the facial structures lose its integrity. They collapse, making the patient look older than he really is. You will find that the skin sags to follow the muscles and the patient loses his youthful appearance. Phase 5: Development of TMJ disorder. Another very unfortunate consequence of night grinding are joint problems. The effects of bruxism is endured by the teeth and the joints. Accepting much of the pressure, the occlusion collapses and the TMJ system begins to malfunction; so that there may be pain felt during jaw movement or one may not be able to enjoy the function of their jaws, anymore. The above problems resulting from bruxism may be avoided if the problem is diagnosed in a timely manner and a night guard is worn on a regular basis. For more information, please read on about teeth grinding treatment.